IEICE Best Paper Award, June 2014. IEICE Excellent Paper Award, May 2011. IEICE Best Paper Award, May 2008. Ericsson Young Scientist Award, November 2001. IEICE Excellent Paper Award, May 2001. IEICE Young Engineer Award, March 2001. J. Kurihara, R. Matsumoto and T. Uyematsu, Relative Generalized Rank Weight of Linear Codes and Its Applications to Network Coding, arXiv:1301.5482, 2013. The paper is a bit lengthy. Please have a look at our presentation slide. R. Matsumoto and M. Hayashi, Universal Strongly Secure Network Coding with Dependent and Non-Uniform Messages, arXiv:1111.4174, 2012. O. Geil and R. Matsumoto, Bounding the number of Fq-rational places in algebraic function fields using Weierstrass semigroups, Journal of Pure and Applied Algebra, vol. 213, no. 6, pp. 1152-1156, June 2009, Download. Y. Sano, R. Matsumoto, and T. Uyematsu, Secure key rate of the BB84 protocol using finite sample bits, Journal of Physics A: Mathematical and Theoretical, vol.43, no.49, p.495302, Dec. 2010. R. Matsumoto and S. Watanabe, Narrow basis angle doubles secret key in the BB84 protocol, Journal of Physics A: Mathematical and Theoretical, vol.43, no.14, p.145302, April 2010. R. Matsumoto and S. Watanabe, Key rate available from mismatched mesurements in the BB84 protocol and the uncertainty principle, IEICE Trans. Fundamentals, vol.E91-A, no.10, pp.2870-2873, October 2008. Download. R. Matsumoto, Quantum multiparty key distribution protocol without use of entanglement, Physical Review A, vol. 76, no. 6, p. 062316, December 2007. Download. S. Watanabe, R. Matsumoto, and T. Uyematsu, Noise tolerance of the BB84 protocol with random privacy amplification, International Journal of Quantum Information, vol. 4, no. 6, pp. 935-946, December 2006. Abstract or Download. S. Watanabe, R. Matsumoto, and T. Uyematsu, Improvement of stabilizer based entanglement distillation protocols by encoding operators, Journal of Physics A: Mathematical and General, vol. 39, no. 16, pp. 4273-4290, April 2006. Abstract or Download. R. Matsumoto, Conversion of a general quantum stabilizer code to an entanglement distillation protocol, Journal of Physics A: Mathematical and General, vol. 36, no. 29, pp. 8113-8127, July 2003. Abstract or Download. R. Matsumoto, Improvement of Ashikhmin-Litsyn-Tsfasman bound for quantum codes, IEEE Transactions on Information Theory, vol. 48, no. 7, pp. 2122-2124, July 2002. Download. R. Matsumoto and T. Uyematsu, Lower bound for the quantum capacity of a discrete memoryless quantum channel, Journal of Mathematical Physics, vol. 43, no. 9, pp. 4391-4403, Sept. 2002. Download. R. Matsumoto, Fidelity of a t-error correcting quantum code with more than t errors, Phys. Rev. A, vol. 64, no. 2, p. 022314, Aug. 2001. Download. R. Matsumoto and T. Uyematsu, Constructing quantum error-correcting codes for pm-state systems from classical error-correcting codes, IEICE Trans. Fundamentals, vol.E83-A, no.10, pp.1878-1883, October 2000. Download. Note: After submitting the final manuscript to the editorial office, we noticed that some results in this paper were also discovered by Bierbrauer and Edel and by Ashikhmin and Knill. R. Matsumoto, D. Ruano, and O. Geil, List Decoding Algorithm based on Voting in Gröbner Bases for General One-Point AG Codes, arXiv:1203.6127, 2012. R. Matsumoto, D. Ruano, and O. Geil, Generalization of the Lee-O'Sullivan List Decoding for One-Point AG Codes, Journal of Symbolic Computation, vol. 55, pp. 1-9, Aug. 2013. O. Geil, R. Matsumoto, and D. Ruano, Feng-Rao decoding of primary codes, Finite Fields and Their Applications, vol. 23, pp. 35-52, Sept. 2013. R. Matsumoto, K. Kurosawa, T. Itoh, T. Konno, and T. Uyematsu, Primal-dual distance bounds of linear codes with application to cryptography, IEEE Transactions on Information Theory, vol. 52, no. 9, pp. 4251-4257, Sept. 2006. Download. R. Matsumoto, M. Oishi, and K. Sakaniwa, Fast encoding of algebraic geometry codes, IEICE Trans. Fundamentals, vol. E84-A, no. 10, pp. 2514-2517, Oct. 2001. Download. R. Matsumoto and M. Oishi, Decoding method for the Xing-Niederreiter-Lam codes. Abstract or Download. R. Matsumoto and S. Miura, On the Feng-Rao bound for the L-construction of algebraic geometry codes, IEICE Trans. Fundamentals, vol. E83-A, no. 5, pp. 923-926, May 2000. Download. 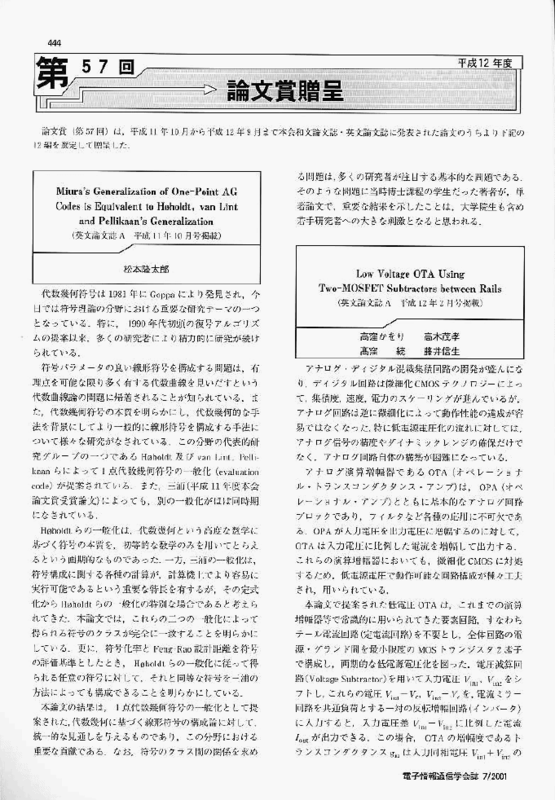 R. Matsumoto and S. Miura, On construction and generalization of algebraic geometry codes (survey), Proceedings of Algebraic Geometry, Number Theory, Coding Theory and Cryptography, University of Tokyo, Tokyo, Japan, January 19--20, 2000 (ed. 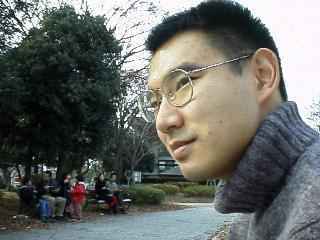 T. Katsura et al. ), pp. 3--15. TeX file, DVI file, PDF file, PostScript file. R. Matsumoto, Miura's generalization of one-point ag codes is equivalent to Høholdt, van Lint and Pellikaan's generalization, IEICE Trans. Fundamentals, vol.E82-A, no.10, pp.2007--2010, October 1999. Download. R. Matsumoto, Linear codes on nonsingular curves are better than those on singular curves, IEICE Trans. Fundamentals, vol.E82-A, no.4, pp.665--670, April 1999. Download. R. Matsumoto, Computing the radical of an ideal in positive characteristic, Journal of Symbolic Computation, vol. 32, no. 3, pp. 263-271, September 2001. Download. R. Matsumoto and S. Miura, Finding a basis of a linear system with pairwise distinct discrete valuations on an algebraic curve, Journal of Symbolic Computation, vol.30, no.3, pp.309-323, September 2000. Download. R. Matsumoto, On computing the integral closure, Communications in Algebra, vol. 28, no. 1, pp. 401-405, Jan. 2000. This tiny paper was rather favorably cited in Integral Closure of Ideals, Rings, and Modules by I. Swanson and C. Huneke. I am glad to find it. M. Naito, S. Watanabe, R. Matsumoto, T. Uyematsu, Secret key agreement by soft-decision of signals in Gaussian Maurer's model, IEICE Trans. Fundamentals, vol. E92-A, no. 2, pp. 525-534, Feb. 2009, Download. K. Kurosawa and R. Matsumoto, Almost security of cryptographic Boolean functions, IEEE Transactions on Information Theory, vol. 50, no. 11, pp. 2752--2761, Nov. 2004. Download. R. Matsumoto, Using Cab curves in the Function Field Sieve, IEICE Trans. Fundamentals, vol.E82-A, no.3, pp.551--552, March 1999. Download. A. Okawado, R. Matsumoto, and T. Uyematsu, Near ML detection using Dijkstra's algorithm with bounded list size over MIMO channels, Proc. 2008 IEEE International Symposium on Information Theory, pp. 2022-2025, Abstract or Download. T. Fukatani, R. Matsumoto, and T. Uyematsu, Two methods for decreasing the computational complexity of the MIMO ML Decoder, IEICE Trans. Fundamentals, vol.E87-A, no.10, pp.2571-2676, Oct. 2004. Download.